Ok, that's not what I called it, that's what the USA network called their Law and Order Criminal Intent marathon but hey, with temps like these, you feel a little psycho. Seriously. 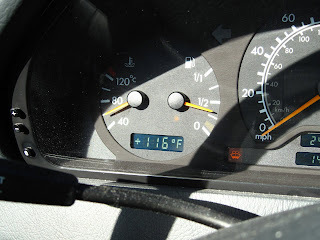 The temp in my driveway Saturday. Shocking that 103 on Sunday would feel a little like a relief. More shocking, temps in the 70's Monday. This among some other small things done this weekend. Lots to do, very little time left. Hope you guys had a good weekend. It was Quilting in the Garden and you can check out the daily blog at the Quilt Show and the C&T blog for photos! I watched the marathon on Saturday too while frantically knitting a baby cap for a shower on Sunday...there were som seriously creepy folks! I remember when I saw the episode with Whoopie the first time... seriously scary perp! And were they referring to the criminals or the detectives??? Youchy, that's some psycho hot weather. LOVE the bag. That ruching/gathering is completely adorable! ohhhhh yes, it WAS a HOT one!!!!!! The quilt show was lovely, but MAN - was it smokin' hot out there - even in the shade. CUTE bag!!!! LOVE the fabrics!!! Very sweet bag Pam. Can't wait to hear about the road trip when I see you in Houston....safe travels. These temps are making me crazy too...100's at the end of September...it's not right! But it is supposed to drop 20 degrees by tomorrow...I'm keeping my fingers crossed! I still can't get over that! WOW! Also hot... that darling bag of yours!!!!!!!!!!! Genius. I just super-sized the pic... dying over the double ruffle. I love that look! GENIUS! 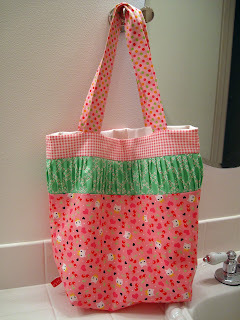 Okay, so you have a super cute bag with super cute fabric. Kitties and cherries!! I believe they are two of your favorite things!! I hope there will be room in the trunk for other things...we'll be packing an awful lot of cute bags! Crazy weather indeed. But, it seems to be cooling off at last.